dedicated to exploration, experimentation and exhibition. 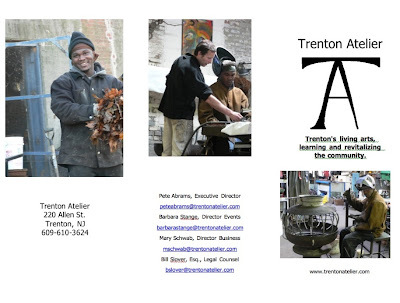 We are presently working out of a factory at 220 Allen Street in Trenton, NJ. This pilot program consists of interns from local colleges and high schools as well as apprentices from such diverse backgrounds as classically trained chefs from France and art teachers from Ghana, to career challenged locals with criminal backgrounds. 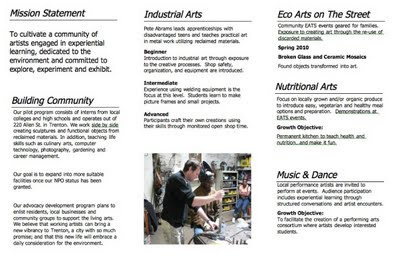 Here we all work side by side creating not only sculptures out of predominantly reclaimed materials, but also teaching life skills such as a culinary arts, computer training, photography, (vertical) gardening and career management. Our vision is to expand this model incorporating the diverse and rich cultures inherent in this area. We must try new techniques, processes and ideas to live within the constraints of the earth, as well as ways to live in unity with our fellow citizens. okay, so i can't do everything..
community and addresses environmental issues we face as well. Need some help here? There is a lot to do. Join us in any way you can!